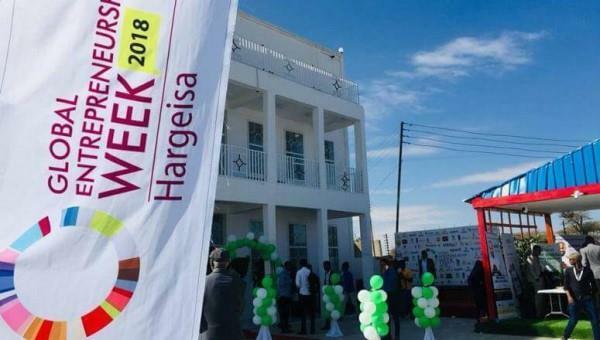 Shaqodoon has launched the first innovation and entrepreneurship hub Hargeisa Innovation Hub "harhub.com" In Hargeisa Somaliland, the hub will provide tangible solutions to the pressing youth unemployment and challenges faced by the country in general. Harhub (Hargeisa Hub) is first entrepreneurship and innovation hub in Somaliland. It was officially opened by the vice-president of the Republic of Somaliland, his excellence Mr Abdirahman Abdilahi Saylici. The hub will offer young aspiring entrepreneurs a platform for innovations, taking their ideas into to the next level and collaborations including high-level entrepreneurship training, timely mentoring and support during incubation stages of startups, modern incubation facilities, free high-speed wifi internet, meeting and training rooms, innovation garden, free canteen, highly affordable membership suites, private offices, tech-loaded co-working space and venue for entrepreneurial events engagements. The launch event falls on the first day of the commencement of Global entrepreneurship which is celebrated on 12th till 18 the November each year, where the world celebrates with the innovators and job creators who launch startups that bring ideas to life, drive economic growth and expand human welfare.. This year, the introduction of Harhub was among the biggest innovations presented during the week and was greatly appreciated by youth, government officials, policymakers, private company supporting youth employment, academic institutions and international NGOs and UN agencies working on youth employment. The opening ceremony was attended by high level government officials led by H.E Abdirahman Saylici, including Minister of youth and sports, the minister of planning and national development, some of president's advisors, CEOs of leading financial institutions (including Takaful Insurance of Africa, Premier Bank and Dahabshiil Bank) and international NGOs and UN agencies. The government of Somaliland, leading private companies and United Nations recognize the role of youth in promoting initiatives and innovation projects that support social development and encourages creativity and innovative ideas that open new avenues to solving some of the global problems. Another event, Diaspora entrepreneurship was held at Harhub during the evening whose objective was to get the diaspora returnee entrepreneurs to meet and network among each other through panel discussions, Q & A, exploring challenges and opportunities in the country. The Somaliland Diaspora agency as well as international and embassy representatives are invited. Shaqodoon for the first time in Somaliland constructed a Youth Innovation and entrepreneurship Hub in Hargeisa dedicated to advancing and nurturing the best innovators and entrepreneurs in Somaliland. Unlike other organizations, Shaqodoon is entirely financing the Hub through loans and internal resources. The hub's objective is to attract talented early-stage technology and business entrepreneurs with innovative ideas and support them to grow and realize their entrepreneurial ambitions while at the same time creating new employment opportunities for our youth. Targeting digitally empowered youth, the Hub sets on the fertile ground for technology, the high entrepreneurial spirit of our youth and the widespread use of mobile telephony in Somalia, to achieve its objectives. Shaqodoon hopes to engage existing hubs and organization in the technology and entrepreneurship eco-system including Universities to create a collaborative environment and build trust among each other to ensure they work together and refer talent to each other for the course of advancing and nurturing our most talented entrepreneurs and innovators. Global Entrepreneurship Week: is the world's largest celebration of the innovators and job creators who launch startups that bring ideas to life, drive economic growth and expand human welfare. Objectives: The aim of the opening ceremony was to officially announce the new building of the Hub and a kick off for GEW. It was also to attract and connect the youth population in Hargeisa to the hub, a place where they can nurture their ideas and entrepreneurial spirits. Since it is a local initiative, it aimed to attract new potential donors and stakeholders to invest the hub's young aspiring entrepreneurs who want to make difference in their future and will contribute to country's economic development. In addition to this, it stressed that supporting and investing aspiring entrepreneurs is the only quick measures to reduce high employment rate in the country. Mohamed Yusuf, Head of office, USAID GEEL, Role of USAID in Youth employment and entrepreneurship how can youth lead innovative business ideas apply for technical and financial support. Ilaria Carpen, Head of office, UNDP Somaliland, Innovative for Somaliland, Future-ready program and how this program can tackle youth unemployment. The vice-president of the nation appreciated the new initiative and encouraged youth to actively participate hub's programs, praised Shaqodoon for such impactful creativity and pushed concerned government departments, youth employment agencies and investors to back the new hub fully operate and support aspiring entrepreneurs. Since the gathering was mainly networking and educating the public about the hub, many people were also watching through live streaming and participated online with bulky of comments and tweets showing that the hub received positive appreciation from youth. The hub has already started offering relevant youth empowering engagement activities. Towards the end of this month, the hub is going to host an international event, Startup Huddle, a free, monthly program designed to educate, engage and connect entrepreneurs. Early this year, the hub management is working on launching the yearly talented entrepreneur's fund. The program aims to invest the best business plans come up by youth. They will also be provided incubation centers to grow their businesses in their first year and during their stay, the new entrepreneurs will attend international entrepreneurship events about business affairs held at Harhub.